If you didn't get your favorite Escapist star's autograph last year, you'll have another shot at it this October. While we don't have the specifics yet, these good folks will be contributing their own style of commentary at various panels, as well as signing autographs at yet-to-be-specified time(s) over the course of the weekend. Additionally, Gavin Dunne, of Miracle of Sound fame, will be performing a live concert at Motorco on Saturday, October 5. Random Encounter will be opening the concert with their videogame music stylings, but you'll need to be 18 or older with a valid ID to get in the door, though if you want to enjoy a cocktail, you'll need to be at least 21 here in North Carolina. Keep an eye out for more details in the coming weeks! 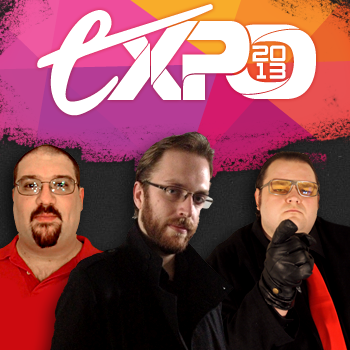 The second annual Escapist Expo takes place this October 4, 5, and 6. If you haven't yet, you can pick up your 1-Day or 3-Day Pass now! If you're the type that likes to lend a helping hand, you can also sign up to be in the Hard Corps, the Expo 2013 volunteer group.